This is perhaps the oldest community graveyard in and around the Anna/Sand Hill area of Warren County. These names were taken from tombstones that were barely standing, knocked over, and in some cases buried just beneath the surface. Some tombstones are missing since earlier listings of the cemetery were published. This was a large cemetery for its day. In my estimation there are at least twice as many graves in the cemetery with just stone markers and no names. There have been some attempts by families who have ancestors buried there to maintain the area immediately where their ancestor is buried by constructing fences around some graves. For the most part this cemetery is about to be lost. Restoring this cemetery would be a great project for a community organization or a group like the Boy Scouts. Sim, W. R (The only date on the tombstone is 1893). (Jas is probably the son of Isaac Spinks who is listed in the 1850 Warren Co census). M.S. (Sandstone marker,,,,possibly Mahala Spinks who was the daughter of Jonathan Wilson and the wife of John Spinks). (In the 1850 Warren Co census, John born in Pennsylvania and Elizabeth was born in Maryland). J.W. 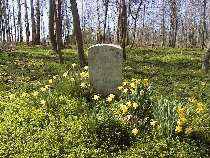 (Sandstone marker,,,,possibly Jonathan Wilson who was born in 1785 in Montgomery County Virginia, and died in 1850,,,grave not far from Woodford Wilson). (Woodford Wilson was the son of Jonathan Wilson and Rhoda Taylor of Montgomery County Virginia, Mariah was the first wife of Woodford and the daughter of Thomas Spinks. His second wife was Elizabeth Miller. He was the father of Granville W. Wilson, Elizabeth Wilson, Arrinda Wilson, William J. Wilson, Emeline Hester Wilson, Silas Wilson, Bluford N. Wilson, Louisa F. Wilson, Benjamin Wilson, Bedford M. Wilson, John A. Wilson, Newton E. Wilson, Albert Russel Wilson, Mary M. Wilson, Robert Wilson, Samual Wilson, and Eliza Wilson.